This harvest was abundant. 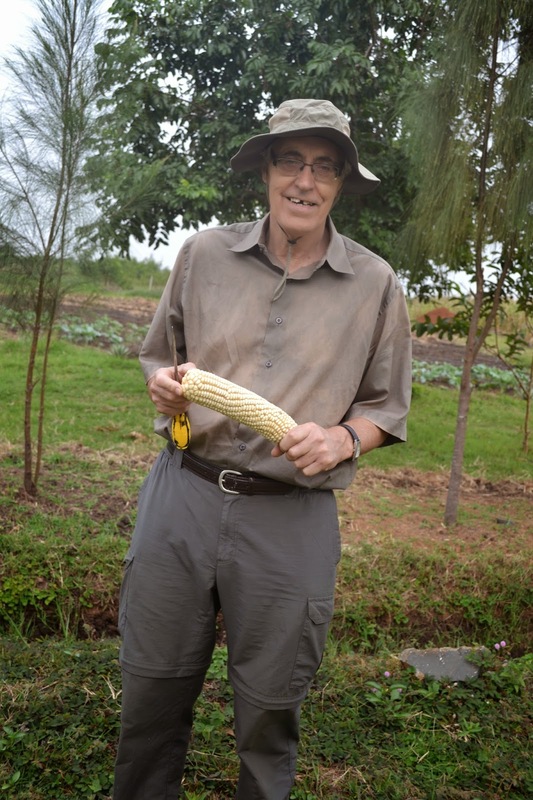 When we arrived at the Widows' Farm in June the maize crop was very green, very tall and many of the stalks had two and some even three ears on them. Many people told us that no crops in the village compared to ours; they were not as tall or fruitful. With the help of many people, including some men, the large field was harvested in one day. Harvesting involves removing the ears, husking them and carrying them to a central place for drying. All of this is done manually. The smaller field was harvested a day or two later in a few hours. Many of the ears were massive - huge! She's so cute and can out-lift some men! When the maize was dry enough to process it was spread out over a large area in front of the farmworker's house/storage barn. We are careful not to exaggerate or quickly assign the supernatural to things; however, when we were "shelling" the maize - stripping the kernels off the cobs - as we were loading large amounts of maize into the hopper of the sheller we noticed and eventually commented on the fact that the mass of the maize that was spread out appeared not to be diminishing. No matter how much we were loading into the hopper the quantity of the rest of the maize was not going down. 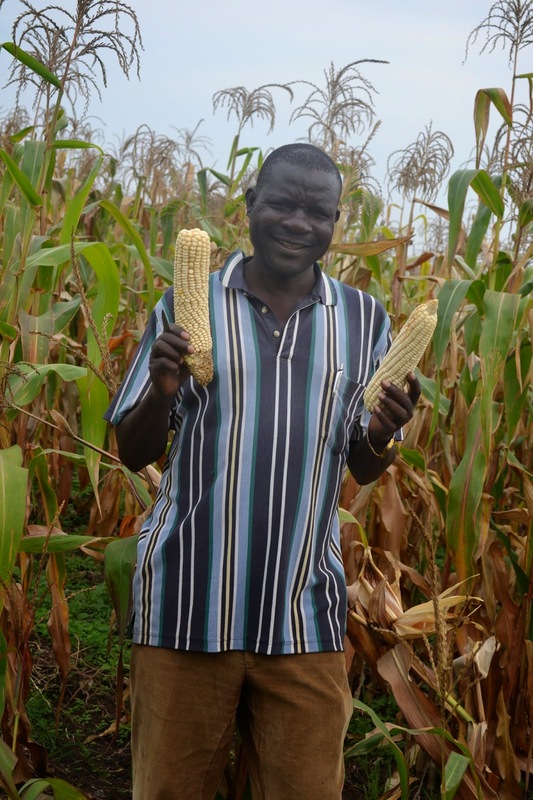 The last time we harvested we filled five 210 liter tubs full of processed kernels of maize. This time we had to buy FIVE MORE to contain the harvest. Wahoo! Margaret and Sarah Gleaning the Cobs. It takes several days to dry and process the maize. Each day it must be spread out in the morning to dry and then brought back in at night; this goes on for about 4 days before we can "shell" it - which took a couple of days this time. There are 3 or 4 faithful ladies who come help with this part. We give them many of the cobs to take home. It is a treasure to them, for they can use them for fire wood. 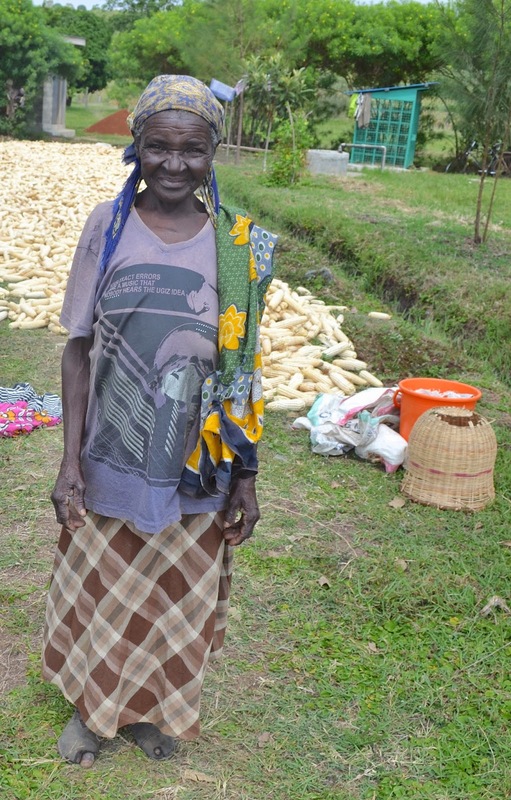 Johnfred has told us that a very large group of ladies came out to plant the next crop of maize. There were so many that it only took one day to plant about 1 1/2 acres. 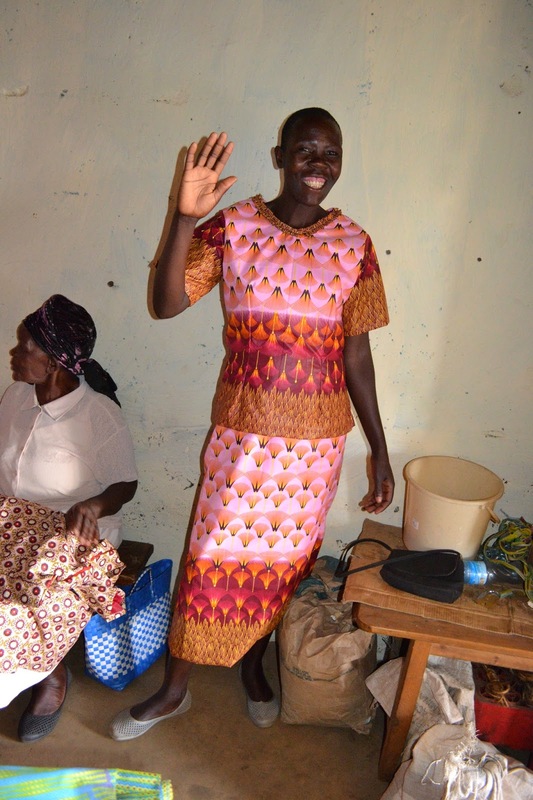 This group were beneficiaries of new dresses that were made possible through generous donations of many of you folks. They said they wanted to show their appreciation by helping with the harrowing and planting. We went to take photos of some of the ladies and their dresses when they went for fittings. They were so happy and several of them posed for the camera. We told them we would be sending some of their photos in our newsletter. We all had great fun!! We are asking you to do something as you read this newsletter. First, we'll lay a foundational background: Johnfred, John and Marty went to visit Angeline, a 77-year-old destitute widow who lives very far back in the bush in a remote, rocky, hilly area. It is an area that is extremely poverty ridden. The people belonging to the church there are among the poorest of the poor. Angeline's pastor, Charles, knows her, but the rest of us had never met her nor knew anything about her. We found her living in a 6X10 single-room mud hut; very small, but it seemed relatively new. Charles explained to us that her house had totally collapsed, and when they came to know her they discovered she was living in the open air under a tree - sleeping there at night. So that small church pooled their resources, gave sacrificially, and built her the best they could afford. It has one window and a door, and she is dry and protected, unless there is a driving rain that blows under the roof. One end of the house - you can see light at the other end! Now, for you to get a grasp of God's brilliant love, power and provision we ask that you put yourself in Angeline's place - maybe it's a bit of role playing - use your God-given imagination and become Angeline for a few minutes. You are sitting alone on your bed (that goes from wall to wall and has a worn out 2-inch piece of foam for a mattress) in your living-room/bedroom when your pastor and three strangers arrive. You know they are coming, but not why. You have been having trouble with your eyes for a while, but about three weeks ago you went blind - you can see some light, but nothing else. You hold your hands out and ask that the people come and greet you because you can't see to go to them. You tell them that God gave you a dream that some white people were coming to see you, so you aren't surprised by the visit of these people from a foreign land. They prayed for you and your house and began to talk with you. You answer their many, personal questions and talk to them about you life and how your three children died at young ages, and how you became a member of RCC (Restoration Community Church) Korwenje, and how your cell group built you a house and gave you clothes. You tell them that you are an intercessor and love to pray, and that God gives you many dreams. Then something totally unexpected happens They give you some tealeaves, some milk, a kilo of sugar, a bag of salt, and 2 Kilos of maize flour. In addition, they give you 3 bars of laundry/dishwashing soap, 2 boxes of matches, and a metal scouring pad for your pots to clean the black off of them from the wood fire. These are things are so useful and even luxurious! You never could have afforded to buy all of these at once. Never! You are praising God and thanking these strangers, when suddenly they tell you that they have a new mattress for your bed. Anjeline on new mattress! The bed fits from wall to wall! You can’t see it, but you ask to be taken over so you can feel it and sit on it. A new mattress! You never could have dreamed that you would have a real mattress! And then – one final thing! They give you a lamp that is powered by the sun. You will have light at night. You will no longer have to buy 5 shillings worth of paraffin (kerosene) to put in your tin-can lamp. You are totally overwhelmed! You begin to shout, “If God can do this for me He can heal my eyes”! All the while you are crying tears of joy and praising God! Before we left, she told us that for years she had been a laughing stock to people. But she said that when they find out what God had done in her life that day she would no longer be a laughing stock. As we stepped out of her house to leave, she began singing praises to God at the top of her lungs. That little house acted like an echo chamber or amplifier, and as we walked away, even at a distance we could hear her singing. Everyone in the area could hear her singing praises and worshiping her God! Now here is part of the rest of the story. Anjeline’s pastor told us that a friend had taken her to a local, village clinic where they said she had severe cataracts. Just prior to our visit to Anjeline we received a very generous donation from a supporter, for the purpose of building several houses, but the person said that we could use some for another purpose if a necessary situation arose. THIS WAS THAT NECESSITY! What a mighty, awesome God we serve. The is door at the left, and see how rain can come in at the top. 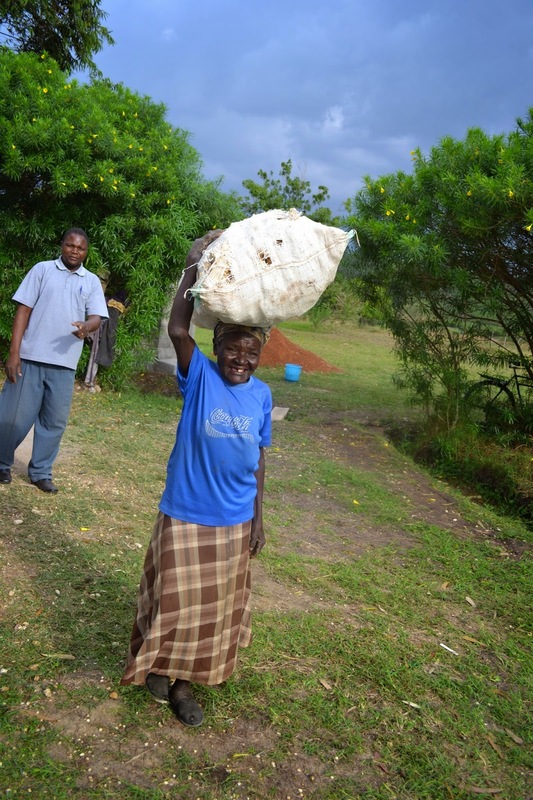 Here she is receiving some maize flour. 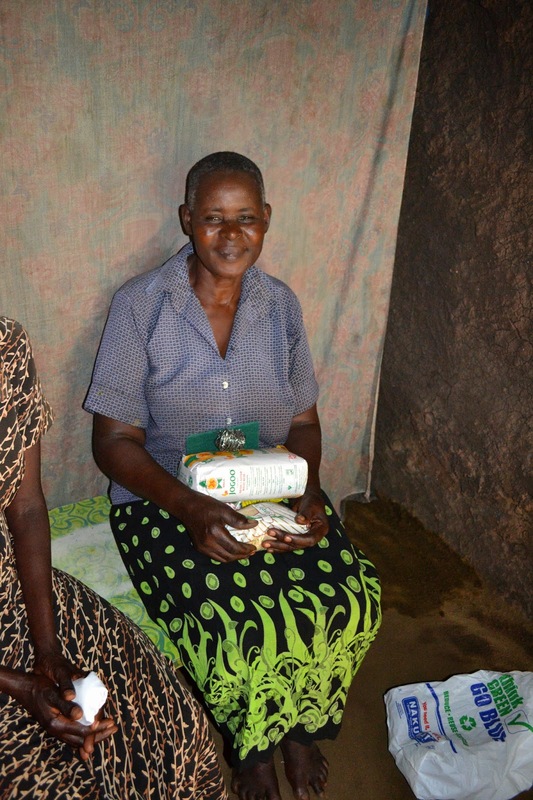 We did not tell Anjeline that we have resources to take care of cataracts. We wanted to speak with Violet, Pastor Hesbone’s wife, who makes all the arrangements for eye surgery. We went to see her. She knew about Anjeline’s situation from Pastor Charles and thought that she could be seen at the eye clinic that we will be having in the main village at Kadawa on August 9. 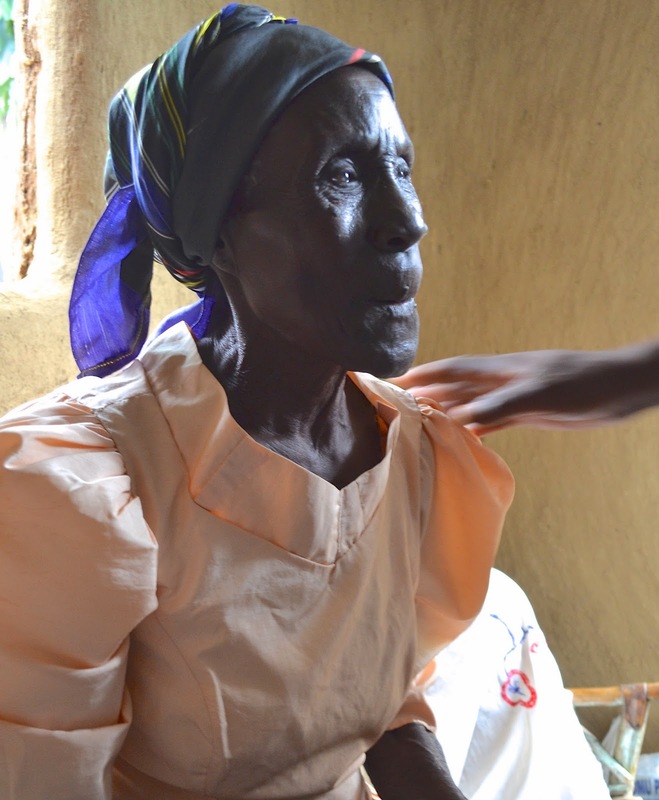 When we explained the remoteness of Anjeline’s location and the severity of her blindness Violet told us of a hospital about one hour away that specializes in cataract surgery. No appointment needed, just walk in, be examined and if surgery is appropriate it will be done immediately. With a lot of phone calls, and coordination, Violet contacted Sarah, a lovely young woman who makes herself available on a moments notice, and Pastor Charles who, in turn, contacted people who could tell Anjeline to be ready at 8:30 the next morning to go to the hospital. 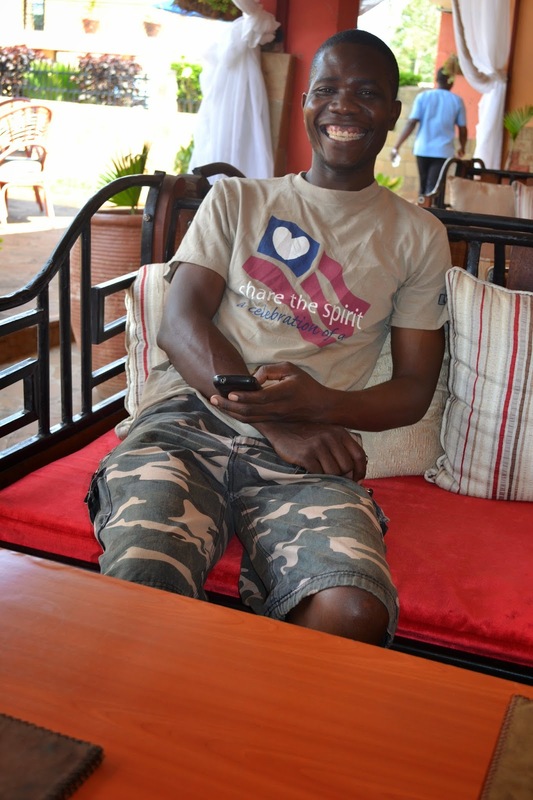 We called Robert, our driver and the next morning he, Sarah and Pastor Charles went to collect Anjeline. Not an easy task leading a blind woman through narrow, rocky, hilly paths to the car, which had to be parked quite a distance away. Once again, a perfect stranger shows up at Anjeline's house, and then explains she has come to take her to see a doctor about her eyes. How could that possibly happen? Then Robert took Sarah and Anjeline to the hospital. This was on a Thursday morning – three days after we had seen Anjeline. On that very afternoon she had the first eye done and Friday morning the second. On Saturday morning Sarah returned to the hospital and walked up to a seeing Anjeline. Her sight has been completely restored! Hallelujah! Just try to imagine that – once again putting yourself in Anjeline’s place. When Sarah went to pick her up at the hospital she asked Anjeline if she knew who she was. Anjeline responded that she didn't know. So Sarah explained and Anjeline was able to see her Good Samaritan for the first time. BTW, when Sarah was taking Anjeline back to her house, she told Sarah that the first thing she wanted to see there was her new mattress! For you medical folks, we want to include some post op instructions that you have most likely never given to anyone. As one of the most important post op instructions, other than the frequent dosage of drops, Anjeline was instructed to stay away from wood fires and smoke for two weeks; she mustn’t get smoke or ashes in her eyes. That means that she can’t cook for herself, for all cooking is done on an open wood fire. Now what? Anjeline couldn’t cook for herself, nor did she have enough food. Culturally she couldn’t ask people for food, but she could ask them to cook her food for her. 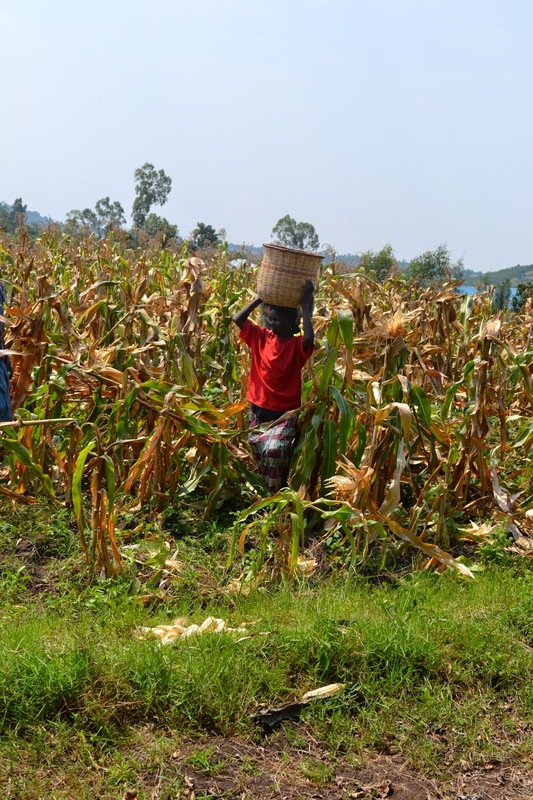 From the widows farm we were able to send, with Pastor Charles, four kilos of maize, several hands of bananas, and two kilos of rice. We also sent some spices, and more sugar and milk. Additionally, we provided money to make up the difference for two weeks of food. 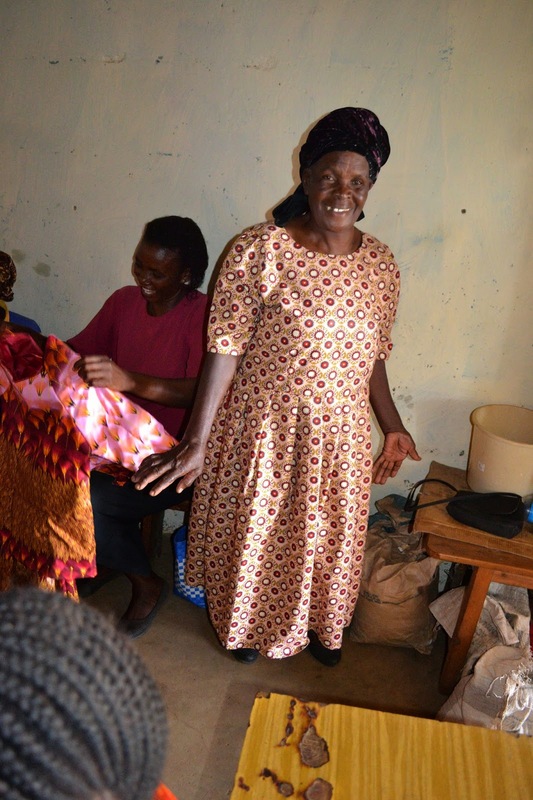 Her cell group (home group) will take turns cooking for her and tending to her needs while recuperating. Wahoo! THE WHOLE AREA IS ABUZZ! Needless to say, the whole area around where she lives is amazed to be seeing her walking around with no one leading her. They are likewise aware that all of these wonderful thing s have been done for her by her church! Anjeline is giving God all of the credit and people are wanting to know more about this Jesus and this God who makes these things happen! But now – here is the REST of the REST OF THE STORY! All of the leaders of the RCC churches decide who amongst the churches is in the most need of a new house. Then they make a list and give to us. We received that list a few days ago and the second person on the list for a new house is Anjeline! Because of that generous benefactor we can build 10 houses for desperately needy women. Anjeline will have a reasonable sized house in which to live, and her 6x10 current dwelling will become her kitchen! She doesn't know that yet! Once again - put yourself in her place. Just think of the impact that will have on the area! We couldn't go see Anjeline after the surgery, so we have no new photo. When we get one we will post it.